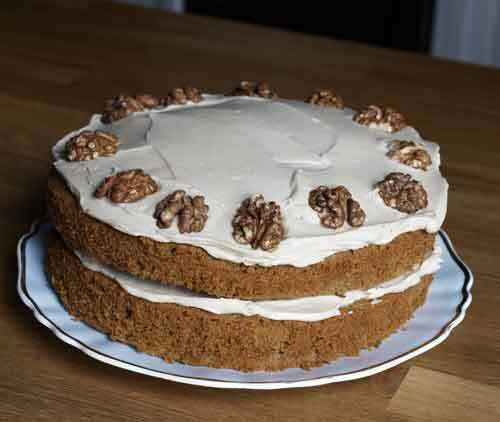 It's my DH's birthday today, so I made him this Coffee and Walnut cake from the BBC Good Food site. I think I would have preferred a stronger coffee taste but the cake recipe was very good and as you can see it turned out beautifully. The frosting/icing is made with Marscapone cheese, light muscovado sugar and Tia Maria - now that is absolutely delicious and not too sweet. I used one 250g tub of Marscapone not the 500g they recommended but you would need the full amount if you were going to cover the sides of the cake. With coffee....mmmm....has to be my favourite. Great with a cup of coffee. Oh this looks super delicious. I often make a coffee and walnut cake for CT for his birthday but have never made such a delicious sounding icing using tia maria. Mmm, looks lovely! Hope Brian enjoyed it and the rest of his birthday! 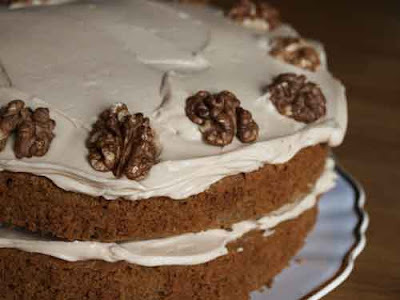 I went through a phase of making coffee and walnut cake every week for ages , but that was years ago. You've just reminded me why I love it so much. how did you get it to rise so well? :o it's beautiful!